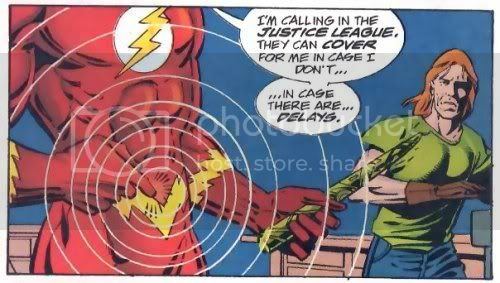 I've just read Flash #136-138, "The Human Race", and the plot is kind of bizarre-- and not really in a good way either, more like "bizarre" as in "ludicrous": some ultra-dimensional highly evolved alien gamblers make Wally race a being from another planet, threatening to destroy the looser's world, and Flash's opponent in the race is a lifeform made from radio waves and also happens to have been Wally's "imaginary" childhood friend with whom he talked through a radio. ... Yeah it doesn't make much sense to me either. Did I mention that over the course of their race on a four dimensional track they travel through a black hole, go back in time, meet blue cavemen (who actually are Guardians of the Universe way back when they were still hunters) and some dinosaur, run through exploding Krypton... and it only gets totally incomprehensible at the end. When he saves that whacky radio-wave world along with earth by tuning all of earth's radios to their frequency after he gambled with the alien that they leave earth alone if he travelled faster back to earth than their instantaneous signal (not that "instantaneous" makes much sense in the first place if they travel through both space and time, but whatever), which he did with enough time to spare to do the fiddling with the radios. But anyway, what I really wanted to say was, that it's really cute that Wally as a kid had a USS Enterprise model in his room. 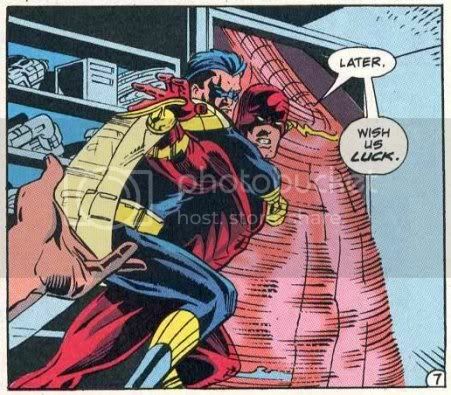 So Wally wasn't just a Flash geek. And his line at the end when he talks with those fourth graders "Linda and I are enjoying a state of mutual cohabitation... although if the principal asks, I'm not endorsing that lifestyle, okay?" was fun. Though I guess it's more a sign of my current state of being completely smitten with Flash-love that I'm looking at the positive in those three issues. "The kid's got no more idea than I do. He's scared out of his mind-- and wound tighter than Madonna's underwear. At this speed, it's all I can do to hang on to him-- and pray I don't look up to see us skidding through the streets of Gotham." ETA: The "[...] she thinks too retro. I don't do sidekicks." line isn't bad either. 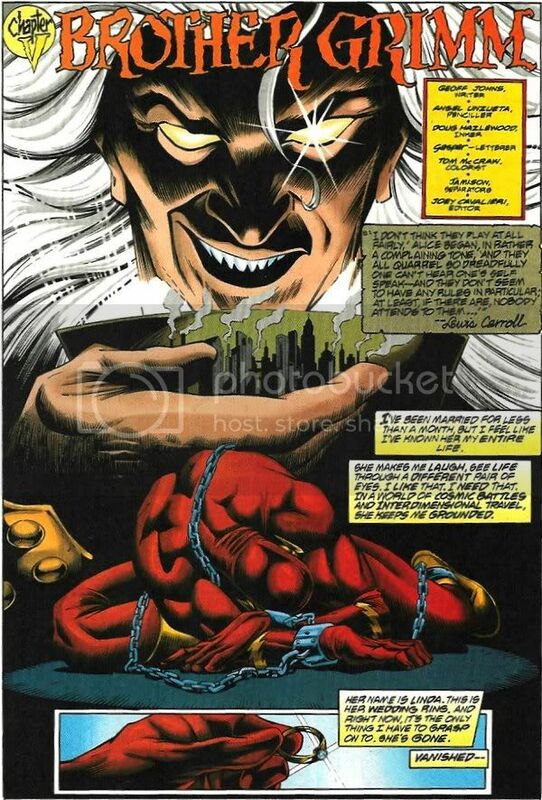 I have a question about that Brother Grimm storyline from Flash #164-169 (the one from which I posted the Flash in chains panels earlier), well actually two questions. In #168 at the beginning we see a landscape without Keystone City, because it has been brought to Grimm's dimension Eastwind using, according to Mirrormaster, a mirror as catalyst -- and at this point I'm wondering if I shouldn't have stuck with just Gotham and its psychotic, but relatively mundane villains -- but whatever, so it's been transported/transformed. But what happened to Central City? It isn't visible either, and we see a vast landscape and no skyline. It's right across the river from Keystone and the river apparently vanished too. Though while they only talk of Keystone City it seems as if both have vanished. I mean, if they hadn't there ought to have been a lot more chaos too, with the cities' economies so closely intertwined, commuters going back and forth etc. Which leads to my second question. The area is supposed to be a transportation center, also a place with significant industry. Why isn't there more chaos as it suddenly vanished? 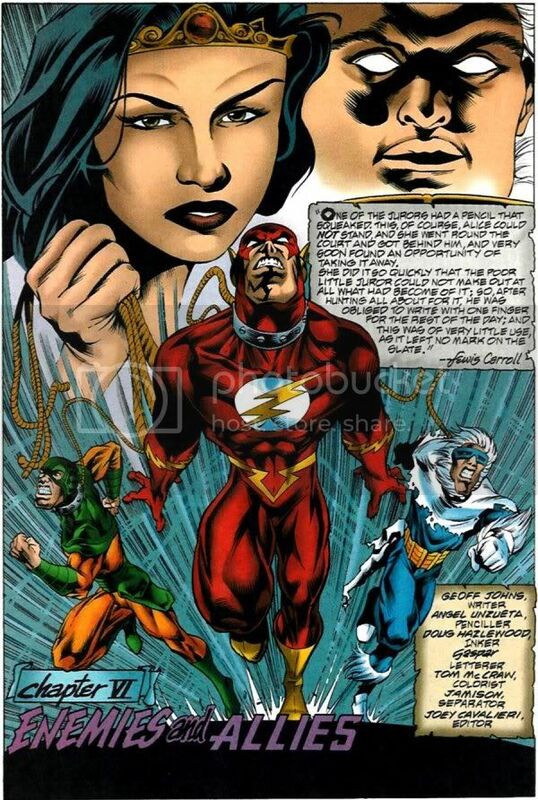 (whether just one or both cities) And with Flash being trapped in that other mirror universe for what seems like at least several hours or so, why isn't there any investigation being started meanwhile, I don't know, from the government or any of the superhero teams? 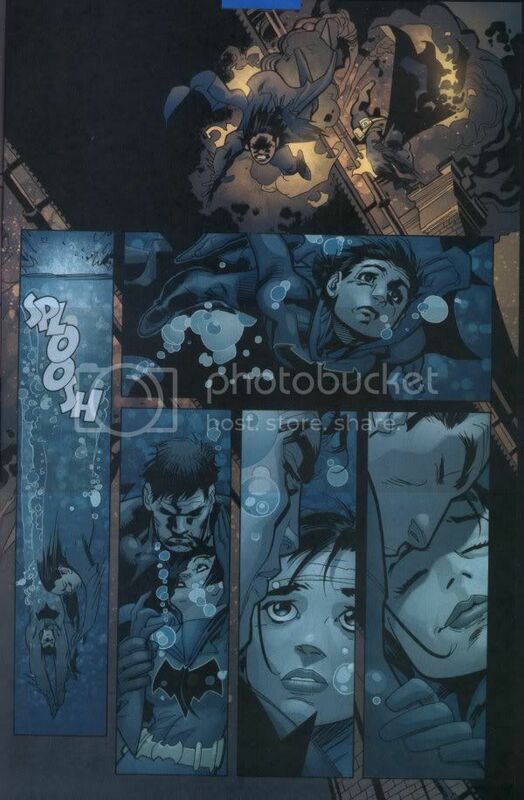 Is it common to give the local superhero some time to handle these kinds of things so that nobody gets alarmed when a large city disappears unless it takes too long? Or maybe people are used to Keystone disappearing, after all from what I've read once it was gone for over a decade because of some supervillain plot, so what's a day or two with it missing? 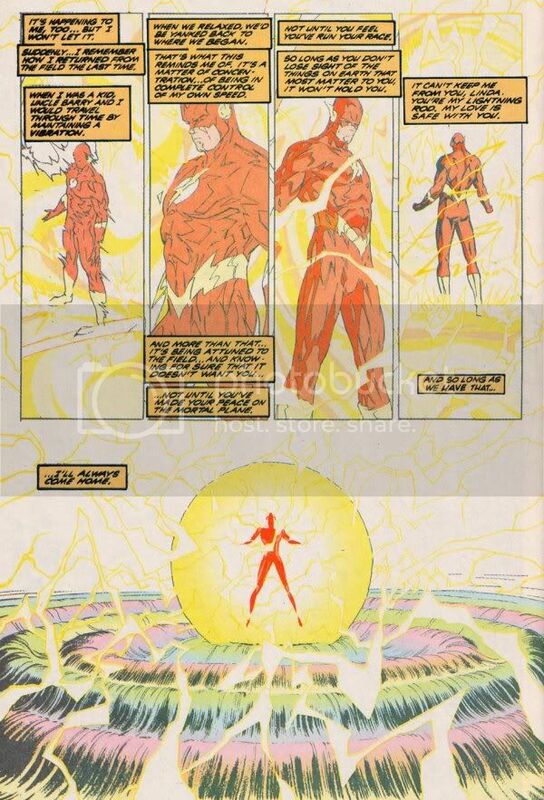 Last night I read the most recent Flash issues, those from #195-207, and I'm kind of torn in my reaction. On the one hand, I really enjoyed the character parts, though of course as usual I was a bit confused by all the people I didn't know. On the other hand the plots make my head ache. 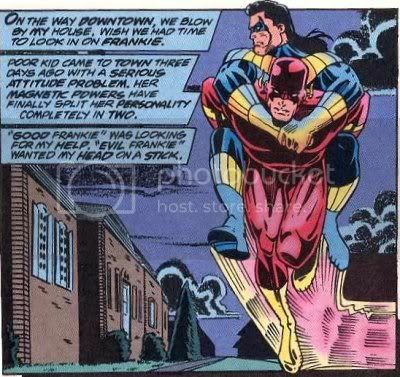 And I don't just mean the ever present time travel stuff, which would be bad enough (I think when I read up on Iris West's background and the whole Reverse-Flash/Zoom stuff to get some idea about what's gone on before, my head just about exploded), though it has some part in it. 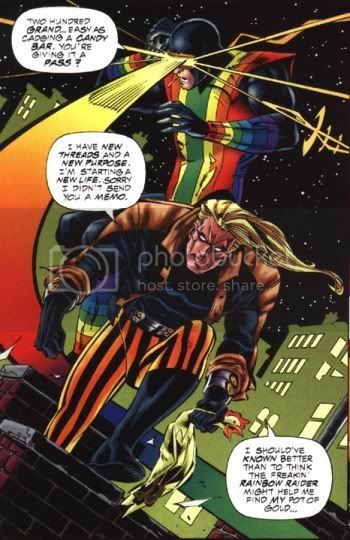 It's several things, the villains, or rogues as they seem to be called in Flash's corner of the DCU, are just -- I don't know, wacky? -- but not wacky in that creepy and scary psychopathic way I like in the Batman villains (though clearly they aren't sane either). Maybe I have to get to know them better to like them, but still. 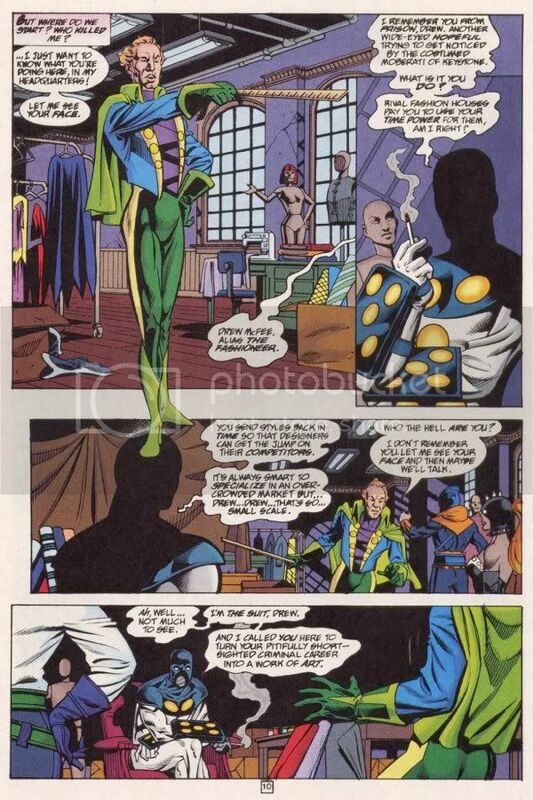 Then between the time travel, and Hal Jordan (as the Spectre) messing with reality in not really explained ways, I didn't much care about the plot. 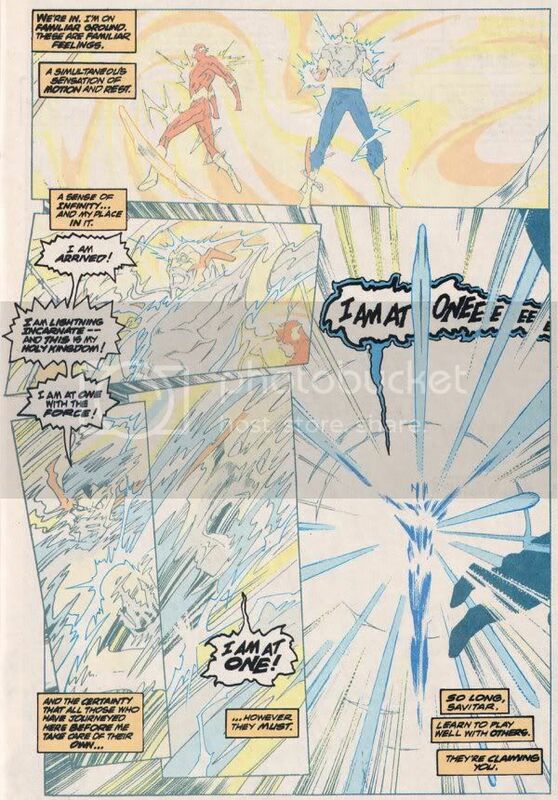 Although perhaps it might have made more sense if I was familiar with the Spectre's powers, still it seems kind of odd that his choice was to mind-wipe everybody, and alter all records and recollections to "help" Flash, yet apparently doesn't have the power to fix Linda's health to help them. 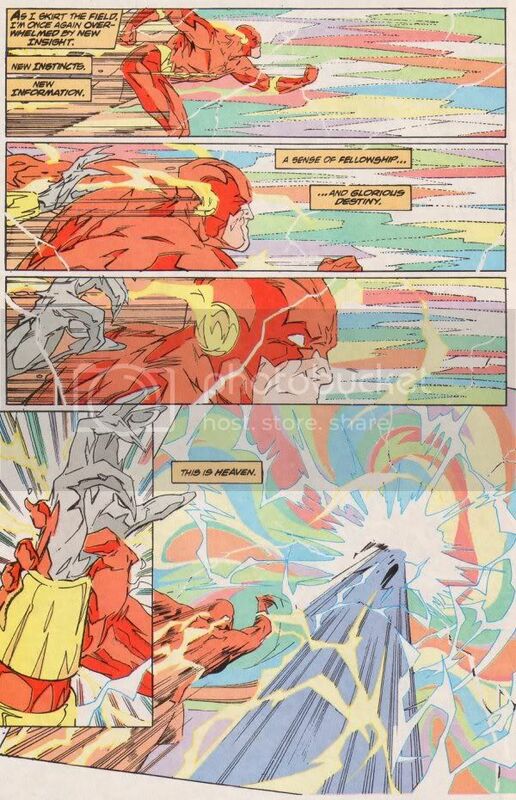 I don't mean fixing the past so that the miscarriage didn't happen (I assume his abilities don't include messing with the past), just heal her, so that she and Wally still could have kids in the future. 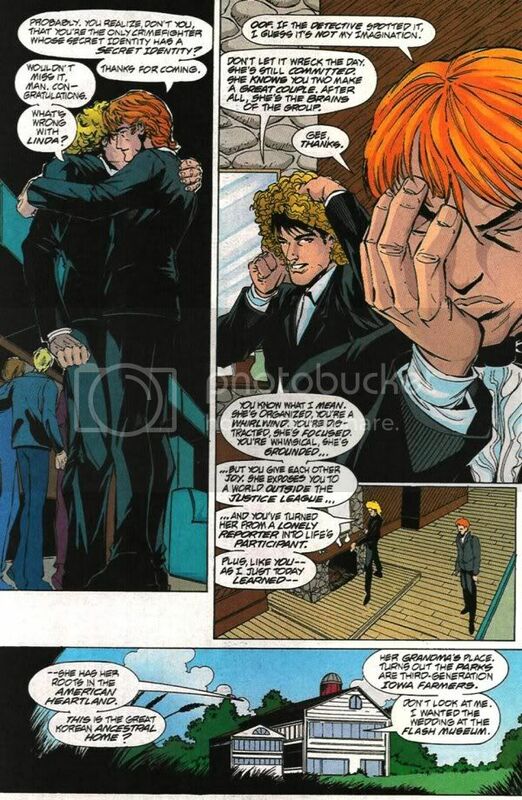 Since he didn't just alter minds but also physical objects like records, his powers can't just be psychic. 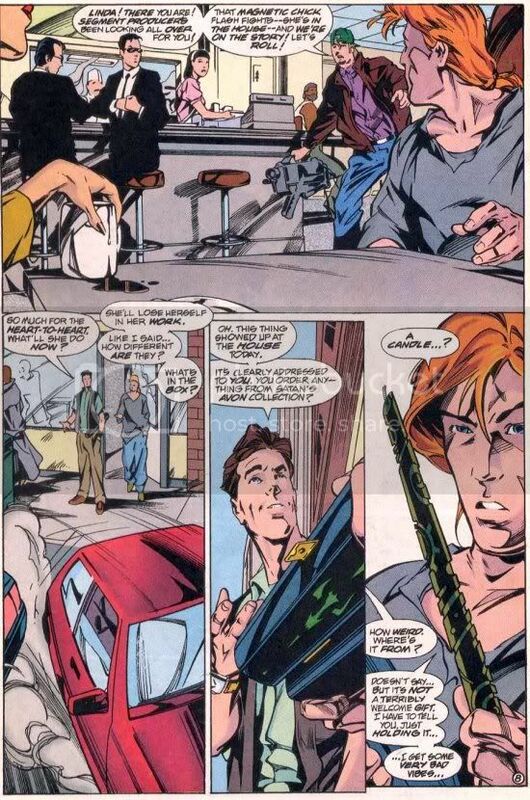 Still I enjoyed to see the Wally West who had forgotten that he is the Flash, and how he rediscovered his identity, and Batman's role in that. 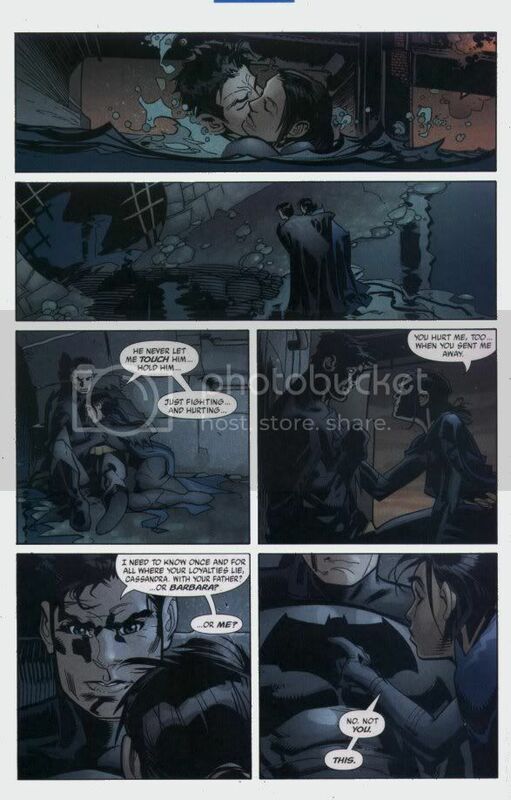 I thought the part with Flash and Batman in #205, and how Batman "unlocked" or reversed (or whatever) his real memories before Flash did, because he researched the "missing" Flash, was great. 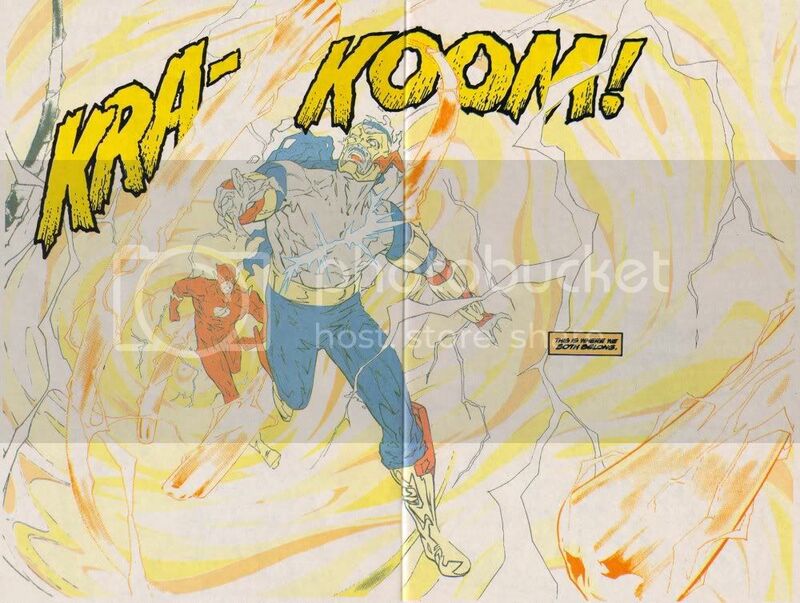 And I see how there is potential in Flash now having a secret identity when he didn't have before. 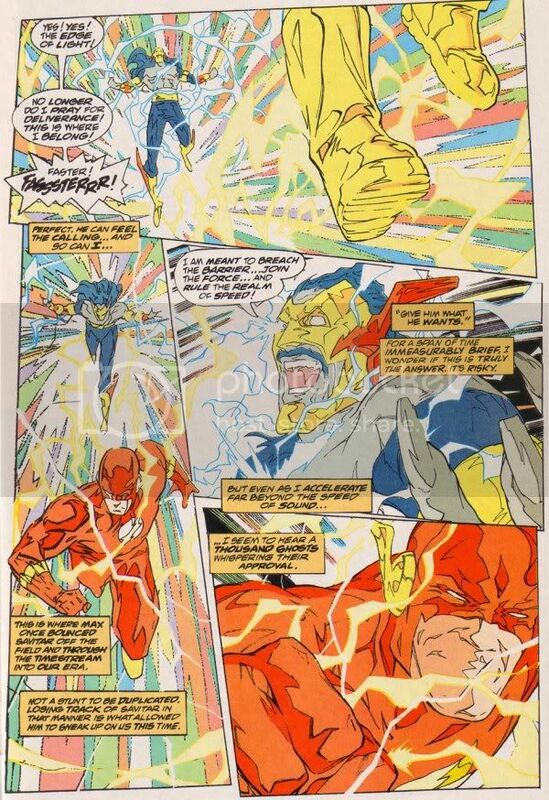 I think I will at least buy the next Flash issues to see whether I can warm up to the villains Flash fights and the time travel wackiness. That I liked the art teams I've seen so far doesn't hurt either. Also, it seems like I need to make a general DCU comics icon, since clearly I'm at a point where my Batverse icon and my Superman icon don't cover things anymore. Though what it could show, I have no idea. Possibly my avatar begging for money with a "Will work for food comics." sign, for when I picked up yet another series... Or on a more positive note maybe me being surrounded by heaps and heaps of comics with the text "There's no such thing as 'too many comics'."